In the 1980s and 90s Lindy Lee was closely associated with appropriation practices, most simply (if reductively) identified as the use of images from other artists' work. Lee's best-known works from this period used photocopied portraits and faces from the 'masterpieces' of Renaissance art, overlaid with veils of paint. 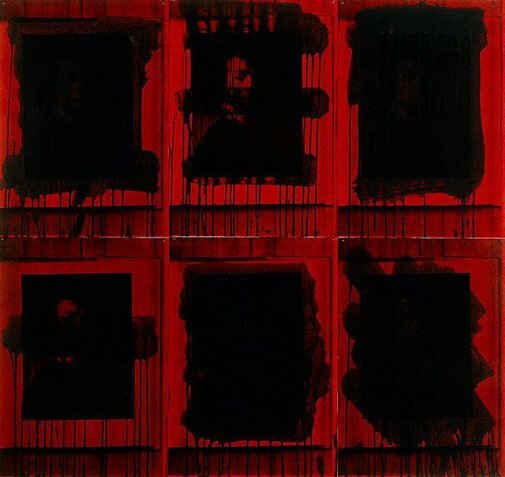 Through repeated copying and the inevitable degrading of the 'original' reproduction, faces would emerge and submerge into inky blackness across multiple panels. This suggested both cultural distance from the iconic original works and our experience of them through ubiquitous reproductive technologies. Yet at the same time Lee's work retained something of the aura of the original by showing just how much beauty could be retained in this repeated, copied and reworked state. The careful aesthetic choices Lee made in selecting and combining colours and images also pointed to more traditional formal concerns which continued to underlie her work. In 'The silence of painters', a self-portrait by Rembrandt printed on a red ground is obscured with brushstrokes of black acrylic which drip and run down the images. Her brushstrokes are highly gestural, suggesting her presence and her hand in making the work. The near disappearance of the Renaissance image into the monochrome panels recalls Lee's interest in American mid 20th-century abstract painter Ad Reinhardt and the ambition of the modernist monochrome painters to erase representation. The grid is a key structuring device in Lee's work enabling the development of visual ideas dependent on repetition and subtle change across the multiple panels. Increasingly in the 1990s her use of multiple units enabled juxtapositions of different colours, of abstraction and representation, and of gestural and flat monochromatic panels. Signed and dated l.l. verso each panel, pen and black ink "Lindy Lee/ Feb 1987". Review: works by women from the permanent collection of the Art Gallery of New South Wales , "Women Artists in the Contemporary Collection", Victoria Lynn, p13-15, Sydney, 1995, 15, 22. Benjamin Gennochio, Lindy Lee , 'Shivering Beneath the Surface', Sydney, 2001, 9, 10 (illus.). Michele Helmrich, Lindy Lee: the dark of absolute freedom , 'From darkness to light: pathos and reverie in the work of Lindy Lee', pg. 15-44, Brisbane, 2014, 19, 22 (colour illus. ), 23, 140.